Gypsophila or Baby's Breath is an annual that produces masses of white flowers on thin, branching stalks. Commonly used in flower arrangements and a great source of nectar for beneficial insects. Convent Garden Market is a variety with large, single white flowers. 9-12 weeks to flowering. Approximately 215 seeds per packet. Gypsophila elegans is native to parts of Europe and Asia. This variety of Baby's Breath is a single form producing large, branching clusters of simple, elegant white flowers to 12mm across on plants growing to about half a metre tall. Gypsophila is a great plant for borders, rockeries or just filling odd spots around the garden. The flowers provide a nectar source and help to attract bees and other beneficial insect pollinators as well as pest species predators to your garden. Gypsophila is a favourite nectar source for adult hoverflies the larvae of which are voracious aphid predators, plant Gypsophila near any aphid susceptible plants to help protect them. The flowers can be used in flowers arrangements and will last a very long time as they dry readily yet still retain their colour. 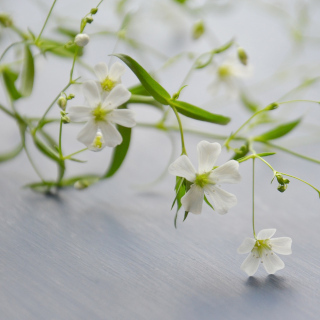 Gypsophila flowers are unscented. Gypsophila is an easy to grow, hardy annual flower suitable for growing in pots or directly in the ground. Choose a growing site for Gypsophila in full sun or very light shade. Ensure your garden soil is free draining, Gypsophila grows best in sandy soils. Grow Gypsophila in containers or in raised beds if your natural soil is heavy in clay or too compacted. Poorly draining soil will cause early death of Gypsophila plants. Dig organic matter such as compost through your garden prior to sowing Gypsophila to improve soil structure and give your seedlings the nutrients they need for healthy growth. Gypsophila doesn't require any additional fertiliser while growing and too much fertiliser will actually cause leggy, weak growth. Mulch around Gypsophila plants well to retain moisture and reduce competition from weeds. Gypsophila is somewhat drought tolerant although it's best to water regularly for consistent growth. Gypsophila grows best in neutral to slightly alkaline soil with a pH range between 6.8 and 7.8. In temperate regions of Australia sow Gypsophila Convent Garden Market seeds from August to December or during March. In cooler regions of Australia sow Gypsophila Convent Garden Market seeds during Spring or Summer from September to February. In subtropical regions of Australia sow Gypsophila Convent Garden Market seeds from August to November or from March to April. In tropical areas of Australia sow Gypsophila Convent Garden Market seeds during the dry season from March to June. Gypsophila seeds are small, sow them no more than 3mm deep covering them only lightly with soil. Firm the soil down around the seeds to reduce surface evaporation which can otherwise dry and kill the seeds. After a few weeks of growth thin plants to about 25cm apart to give them plenty of room to grow. Gypsophila seeds take between 6 and 14 days to germinate once sown. Gypsophila takes 9 to 12 weeks to start producing good quantities of flowers.